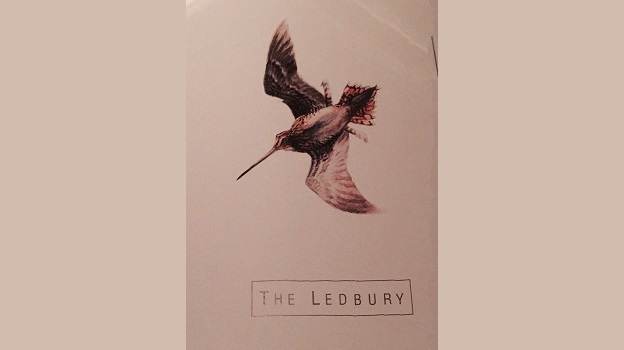 The Ledbury is my favorite London restaurant. I go every time I can when in Great Britain’s beautiful, cosmopolitan capital, which is every other month or so. 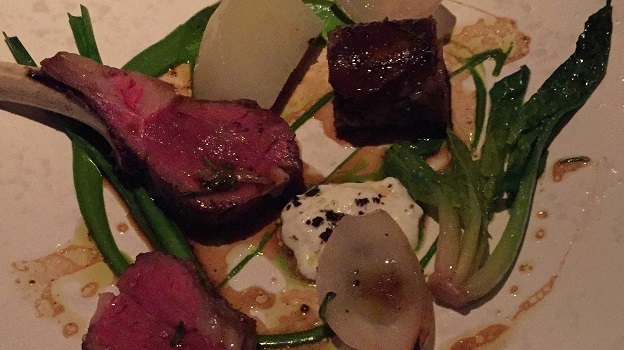 Of course, given that the Italian-coached Leicester City soccer team has a real shot at winning the Premiership this year, I’m in the UK even more often than usual, but I wouldn’t need sports as an excuse to go to The Ledbury every chance I get. Chef Brett Graham has conjured up a masterpiece. I wonder if he ever gets tired of counting the awards: two Michelin Stars, number 20 on the San Pellegrino World’s 50 Best Restaurants 2015 list, Best Restaurant in the UK for the Observer Food Monthly Awards 2014, as well as for the All in London Ultimate London Restaurant (2012, 2013 and 2014) and the Restaurant Magazine National Restaurant Awards (2010, 2011 & 2012). It’s enough to get you tired before you start eating! In fact, the only (small) complaint I might have is that some tables are placed very close to each other, although you can call ahead and ask to sit at those where you are not likely to have to listen to the marriage woes of the couple sitting next to you. 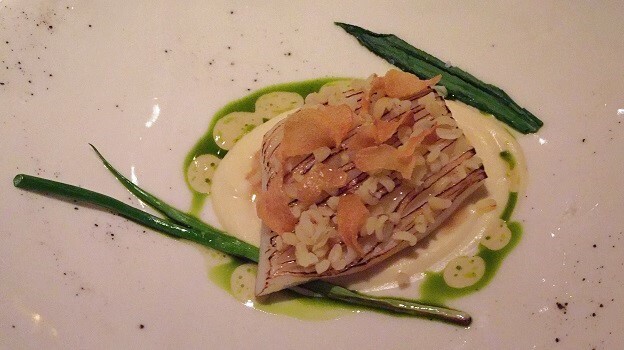 Nevertheless, the food is superb and beautifully presented. 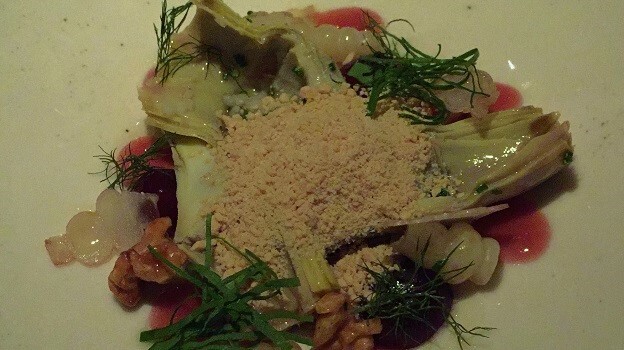 On this night, my favorite dishes are the savory, sneakily concentrated roast cauliflower lobster butter, basil and Parmesan, and the fresh artichokes, accented with violet and chinese, muscat grapes, walnuts and grated foie gras. 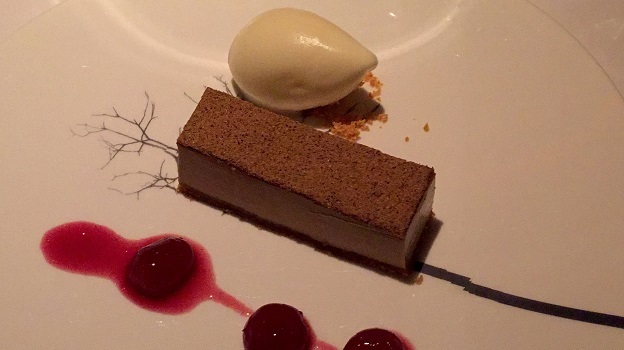 The wine list at The Ledbury is kilometric, and takes some time to navigate. My suggestion is that you study it ahead via the restaurant’s user-friendly website, or run the risk alienating your dinner companion. Head sommelier Seamus Sharkey is young, modest and polite, but also quite knowledgeable. I found his suggestions to be extremely well judged. While trying to decide what to drink, lubricating the old grey cells with the 2005 Raveneau Chablis Grand Cru Valmur was, no pun intended, a no brainer. Anyone who reads Vinous Table with even a modicum of attention has probably figured out by now that Raveneau is not just my favorite Chablis producer, but one of my three or four favorite white wine producers of all. These are wines I simply never tire of drinking, especially when they have a little bottle age on them. Unfortunately, this Valmur bottling, still so youthful it comes across as almost simple, is just too big and almost blowsy for my (Chablis) taste. My advice is to forget about it in the cellar for another five or six years and see what happens. Up until the 1980s, the Mosel’s Dr. Fisher was one of my favorite German producers. Then the estate went through a tougher patch and the wines weren’t always quite at the level they should have been. 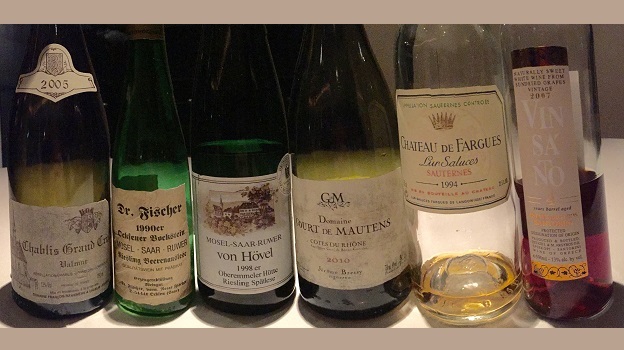 However, the beautiful 1990 Dr. Fisher Ockfener Bockstein Riesling Beerenauslese is a marvel of sweet-acid balance and is a perfect match for the artichoke dish, where the foie gras really sings in tune with the BA’s gorgeous noble rot and honeyed nuances. I can’t stress enough just how great it is to kick off meals with sweet wines, especially when they have this amount of fresh acidity and low alcohol by volume. That said, this is not the best bottle of this specific wine I have ever had. Most likely, a less than stellar cork seal contributed to the wine being a little more tired than some other bottles I have recently enjoyed (I bought a ton of Dr. Fisher Auslesen and BA wines in the 1980s, up to the 1990 vintage included, and so have monitored their development regularly over the years). Readers might find it interesting to know that the estate is now Italian owned, as it was recently bought by Alto Adige’s Foradori family, owners of Hofstätter. Next up is the lovely 1998 Von Hövel Oberellemer Hütte Riesling Spätlese, a very good match with both the roast cauliflower and grilled cuttlefish dishes, though the wine, at almost twenty years out, is still a baby and a long way from being even close to being within its optimal drinking window. Fairly sweet and rich, but lifted by bright acidity and showcasing noteworthy purity and precision of textbook Mosel Riesling aromas and flavors, this Spätlese is drop-dead gorgeous and irresistible. Next, I follow Seamus Starkey’s suggestion and opt for the 2010 Domaine Court des Mautens Côtes de Rhône Rosé, a lovely and judiciously oaked rosé wine that is far more complex and rich than most rosés I or you might come across on most nights. While the 1994 Chateau de Fargues Sauternes is a reminder of a tough vintage for many of Bordeaux’s sweet wines (this bottle was angular and drying), we hit the bullseye with the 1988 Blandy’s Madeira Malmsey (rich, luscious and actually not all that sweet on the long finish) and the 2007 Estate Argyros 4 Years VinSanto Santorini (another good suggestion from Starkey). The latter wine, though still young and not the last word in complexity, offers lovely refinement and discretion on the palate. And you’ll find yourself thinking that those very traits, discretion and refinement, are just what The Ledbury offers in spades.